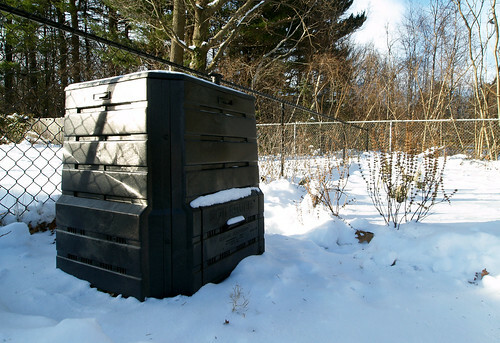 It’s a winter wonderland out there, but installing a new compost bin sure warms my heart. Starting a pile in the winter probably isn’t ideal since there’s little brown matter to be found. But with some shredded newspaper and other household paper, hopefully I can give the pile a decent start. Have you ever tried to start a compost pile in the winter? Do you have any tips to share? I also compost throughout the winter. I use the open wire compost bins and fill them with shreded leaves, grass clippings and kitchen scaps in the fall. I continue to add kitchen scaps throughout the winter. I usually don’t have to turn the pile during the winter becasue the worms are doing their job breaking down the matter. In the spring the pile is usually reduces to 1/4 of the size with finished compost on the bottom and the nearly composted material near the top that is good for mulching the plants. I think that’s it: just keep composting, and let the microbes do their work. I’ll probably have to wait to see any happy returns since I’m starting fresh in the winter. But I’m willing to wait! I am a lazy composter, or, rather, an other-priorities composter. I don’t have the strength (or interest) in regular turning, so I let nature do its thing, slowly. We have a porch, and I built two bins that are easy to access year round, attached to the porch. They are both protected against such critters as skunks or bears. When one is full, it rests for about a year. Then it gets shifted into a pile outdoors. I add everything. And I don’t worry about equal quantities of this or that substance. During summer, plenty of weeds, and dirt, get in there, and later, leaves. it all evens out in the end. Oh, and if you are concerned about odour, wood stove ashes do a great job.